We hope you can join us for our BIG Open Day on Saturday 22nd June! 2019 plans to be our biggest Open Day yet and we have lots of things planned. There will be the opportunity to see a stoma care nurse (pre-booking required). There will be workshops in the morning and afternoon giving you the chance to try out chair yoga and a ‘Creative Minds’ art session. You can attend a talk on nutrition and ask our expert questions. UK Airport security and special assistance teams will also have a stand, so you can talk through any air travel queries you might have. In the evening we will be having an ostomate fashion show, which we know is always popular. Many of the stoma manufacturers will have stalls. 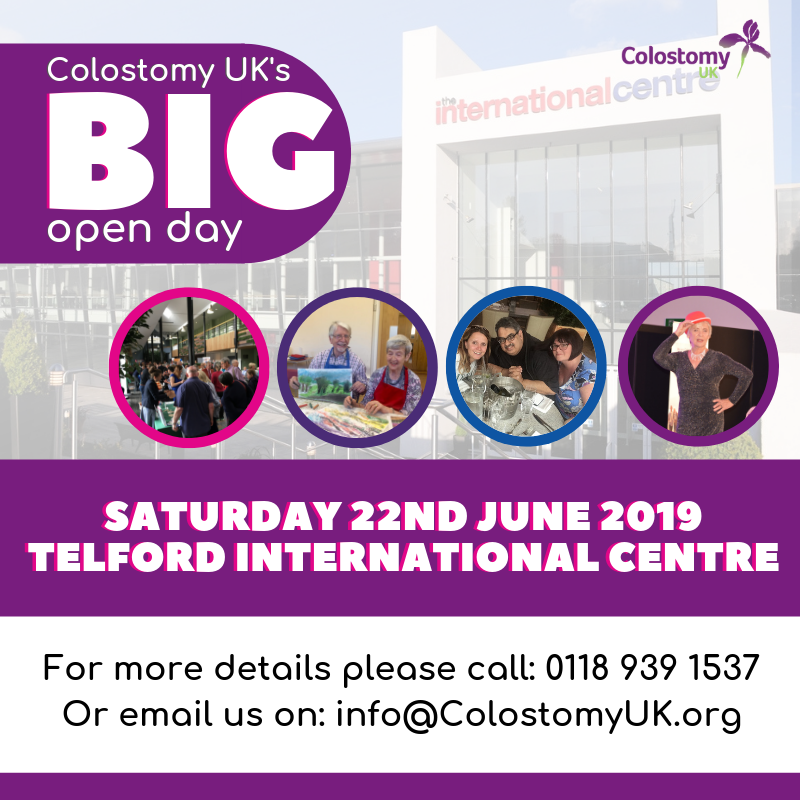 You can also meet the Colostomy UK team and catch up on our latest news. The venue is 2 minutes by taxi from the train station, but is also serviced by a direct bus which drops you outside. Free car park onsite. Tickets for our open day are completely free, but if you’d like a lunch at the venue the cost is £10. This needs to be reserved in advance. Alternatively the venue is just a short walk from the town centre. A member of our team will book you into any sessions/appointments you’d like to attend. Please let us know if you have any special dietary or accessibility requirements.